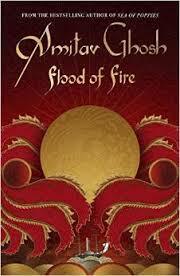 I think I can honestly say that I have never read a better series of historical fiction novels than Ghosh's Ibis Trilogy. The series starts with opium farmers in India and ends with the gunboat diplomacy that forced China to open its ports to British trade and to accept a series of unequal treaties. The trilogy as a whole is an amazing critique of colonialism/imperialism, all the while exploring how the financial windfall of the opium trade helped to change individuals, families, communities, nations, diplomacy and international relations and left effects that linger in into our modern world. To say this trilogy is epic in proportion is no understatement, but it is so compelling that waiting for the publication of the third installment was sheer torture. 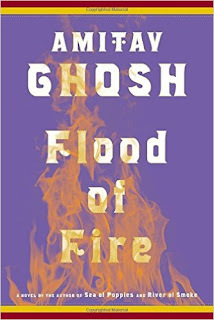 I read somewhere that Flood of Fire can be read as a standalone novel, but I have to disagree here -- there is an incredible richness of depth that exists when you read all three novels, plus there are recurring characters whose lives intertwine over the space of all three books. "the backdrop to this historical adventure is the Opium Wars, when the British East India Company lured China into a fatal dependency on opium from its Indian territories. Its vast sweep ranges from the wide lush poppy fields of the Ganges to the narrow confines of repressive households, from the rolling high seas to the cramped quarters aboard ship..."
"...fate has thrown together a truly diverse cast of Indians and Westerners...sailors, coolies and convicts ... a bankrupt raja, a Chinese opium addict, a lissom French runaway and a mulatto freedman from Baltimore. As their old family ties are washed away, like their historical counterparts, they come to view themselves as jahah bhais or ship-brothers." It is that small contingent of people whose stories continue in River of Smoke that moves most of the action to China where the Emperor is desperately trying to stop the influx of opium. Tensions between the Chinese and the opium traders reach a fever pitch, ending with the confiscation and destruction of all opium from traders and merchants. This act sets the scene for the final novel, Flood of Fire, where with so much money at stake and a demand for "free" trade, the efforts of one empire to repel another turns into full-blown conflict which ultimately changes the world map. The smaller stories that take place within the bigger picture reveal exactly how the lives, loyalties, and fortunes of both men and women changed during this period of time, all told from various perspectives of the characters who lives play out within this very broad sweep of history. Quite frankly, I have a huge number of pages tabbed with things I wanted to remember, there are so many things I want to say that I could fill an entire notebook. So I'll limit the rest of this post to just a couple of key ideas. 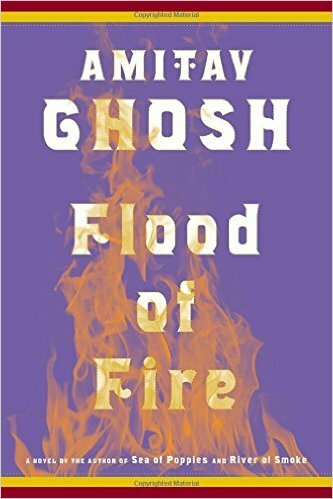 First, during the course of this story, Ghosh makes the point that the British, in their quest to save the lucrative opium trade by force, spun things so that they became a matter of "the divine Mission that the Almighty Himself has entrusted to our race and our nation,"
"freeing a quarter of mankind from tyranny; of bestowing on the people of China the gift of liberty that the British empire has already conferred on all those parts of the globe that it has conquered and subjugated." "give to the Chinese the gifts that Britain has granted to the countless millions who glory in the rule of our gracious monarch, secure in the knowledge that there is no greater freedom, no greater cause for pride, than to be subjects of the British Empire." This from a man who will not be involved in the fighting itself, a man who is just trying to save his financial investments, create new ones, and hold on to his wealth. Second, it is obvious that the author put huge amounts of research into this book and into the other two novels preceding it. In this book alone we get a behind-the-scenes glimpse of capitalism at work (in the form of futures trading, secret auctions, manipulation of prices, etc. ), we see at eye level the Indian forces that fought alongside the British -- their uniforms, their training, the differences between various fighting units and the camp followers that played an integral role; at the caste/class systems at work, and by no means least, at the Opium Wars themselves. At the same time, the history never gets overbearing or tedious -- the facts are well woven into the lives of his very realistic, believable characters. I could go on about this book -- the fun plays with language, the palpable tension that the author manages to evoke, etc., etc., but I won't. Instead, I'll just say that Flood of Fire is the perfect ending to a perfect series, and as I said, the entire trilogy is simply amazing -- I doubt there has been anything like it before and I know that there will not be anything like it again. I definitely recommend this book and its predecessors to anyone who enjoys quality historical fiction, excellent writing, and a great story. I'm so sad to see this series come to an end. It is absolutely magnificent, superb, and all manner of superlatives. GO READ THESE BOOKS! !